Mix the miso and hot water together. Add in tahini and stir until well combined. It should have a dressing consistency. 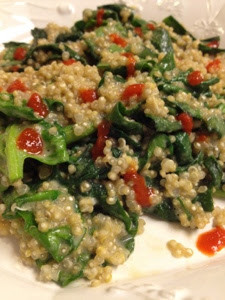 Mix the hot, cooked quinoa with the spinach until it wilts. Toss in the dressing. Eat!